We’re all desperately trying to find more time in our day. We find it in different ways but usually something gets sacrificed in the process - whether its sleep, a healthy meal, time spent with family, time spent doing our jobs, or time for ourselves. Maybe all of the above? My family is far from perfect at managing our time and I never seem to get enough sleep, but we do have a few tricks that help us keep our sanity and still get to piano lessons more or less on time. The slow-cooker is one of the greatest inventions ever. We have two crock-pots that we use for soups, stews, chili, pulled pork, roast, and whatever else we can make in them. They’re perfect for having dinner ready when you get home so everyone can eat quickly and get to whatever activity is going on. This takes a little planning and preparation to make sure you have the ingredients on hand. Occasionally, we’re up a little late to get it all ready but it beats fast food. It seems like almost everything now has a computer built into it. The miracle of the Internet of Things even allows us to automate the dumbest of appliances. We use the timer on our dishwasher and washing machine regularly to help us get things done. This works especially well for simple loads like towels. Put them in the washer before you go to bed and set the time so they start about an hour before you get out of bed. When you get up, throw them in the dryer. Who cares how long they sit there as long as they get dry. You can even throw something else into the washer and set the timer before you head off to work so that they’ll finish around the time you get home. Get as much ready the night before as possible. My evening routine involves preparing my coffee - which is on a wifi connected outlet scheduled to turn on every weekday morning - along with as much of our lunches that can be prepared. When I go to bed, our lunch bags are on the counter with napkins and silverware. Our lunches - usually leftovers - are in the fridge ready to grab and throw into our bag. We all have clothes laid out the night before and alarms set. Teach your kids to help out. We have to keep reminding ourselves that we are raising future adults, hopefully not future slobs. We have slowly been getting our kids to help with things like emptying the dishwasher, dusting, and doing laundry. Our oldest has been gathering the garbage for quite a while although I still have to remind him. It’s become standard procedure for my oldest to empty the dishwasher when he gets home from school. Stagger your schedule with your spouse if possible. This may not work for everyone but we’ve been fortunate to be able to stagger our work schedules. Unfortunately that means I get up between and 5:30 each day so that I can make my long commute to be at work by 7 or 7:30. My wife gets up a little before the kids and gets them off to school before heading to work around 8. Getting to work early allows me to get home around 4:30 or 5 so that I can get dinner ready and helps me get kids off to their activities. Constantly communicate with each other. None of this would work at all if my wife and I didn’t constantly keep each other informed of what’s going on. Occasionally, we have to call or text each other during the day to confirm the plan for the evening. We also remind the kids in the morning especially if there is something out of their usual routine going on like a dentist appointment. Sometimes after the kids go to bed, we find ourselves just talking to find out what went on that day and discussing any events going on the next few days. Have lists and calendars available for everyone to see. Finally, the main tool that enables us to keep track of what’s going on is an app on our phones called Cozi. 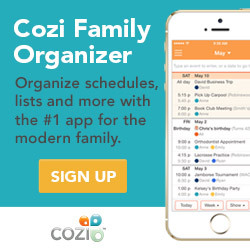 Cozi is a calendar, to-do list, shopping list, and even recipe organizer all accessible on your phone or the computer where you can both see it. We use the calendar extensively and then have a weekly calendar on the wall of our kitchen that we update every Sunday for the week so that the kids can see what’s going on too. What I love about it is that it updates immediately. I have been grocery shopping while my wife is still adding things to the list from home. Cozi is free but they display advertisements. A paid option is available to remove the ads and give you a few extra features. In full disclosure I am an affiliate for Cozi so if you click on the banner below and sign up, I may make a small commission. But, I really do love Cozi and we have been using it constantly for a few years. I wouldn’t recommend it otherwise. Like I said, we’re far from perfect but we almost never eat fast food and we manage to eat dinner together at the table most evenings while still having our kids involved in a couple activities each. I hope that something here will help you tame your schedule a little so that you can enjoy some family time together too.